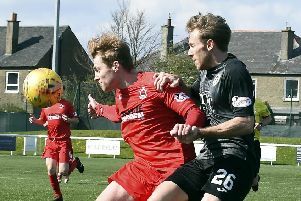 Having seen Tuesday’s game at Stirling Albion called off while the players were stripped and standing in the tunnel, Edinburgh City’s bottom-of-the-table encounter with Cowdenbeath at Ainslie Park tomorrow has suffered the same fate before it got anywhere near kick-off. The midweek clash fell foul of some dreadfully-timed snowfall, which didn’t make the pitch unplayable but did obscure the pitch lines quicker than the determined chap with the leaf blower was able to clear them. With Edinburgh having been subject to a first-ever red weather warning throughout Wednesday and Thursday and temperatures unlikely to rise sufficiently before the weekend, the decision was taken by the SPFL yesterday to postpone tomorrow’s fixture. Therefore, Gareth Rodger will have to wait a week before getting the opportunity to build on his impressive contribution to the 4-0 win over Elgin last Saturday, having returned to the starting line-up to good effect at both ends of the park. “I’ve been out the team through injury and then just selection,” said the former St Johnstone defender. “The boys have done pretty well since the turn of the year so I wasn’t playing much, which was a bit frustrating for myself, but I kept training hard and eventually I got my chance. I was hopeful it was going to come and I’m glad it did. It was through illness to one of the other boys but that doesn’t really matter to me. I got my opportunity and I’m glad I took it. I got a goal which was a bonus and now I’m just looking forward to getting a run of games. When you haven’t played for a while you want to get as many games as possible. One positive was that City avoided any further injuries, the regularity of which has meant those out of the team have found game time coming their way before too long. “The manager [James McDonaugh] said to me when I wasn’t playing to keep training well and be ready,” Rodger recalled. “With the injuries that are going on, and obviously you can never tell when another one is round the corner, eventually you’ll get a chance, whichever way it may be. As Rodger explained, finding the scoresheet was a bonus, even if it wasn’t the prettiest. “I honestly don’t really know what happened,” he said. “I remember making a run and I think it hit off my thigh – it was said it hit off my backside but I’m trying to give myself a bit more credit in that it came off my thigh and was good technique!